Subject Advisors and teachers at Qwaqwa in the Free State were amazed at the concentration that these grade 3 learners displayed when left on their own (with their right brains!) to write and illustrate their own stories. 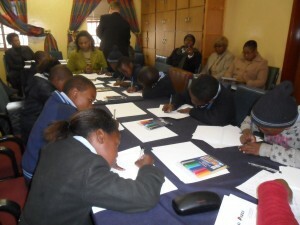 These children were writing stories in isiXhosa. The Free State Department of Education commissioned Felicity Keats to train 10 grade 3 learners and 10 subject advisors in each of 5 districts across the Free State. These small children wrote their own books in different languages and they will be launched on the 24th October at a big launch with the MEC of Education present. Felicity is to be a guest at this launch.